Young Workers Find Opportunity In Power Industry A large sector of the work force that runs the electrical system in the U.S. is expected to retire soon, depleting the supply of workers to maintain the grid and keep the lights on. So power companies find themselves training new workers to repair and maintain some very antiquated equipment. Apprentice linemen Brent Bottemiller and Jeff Steiert practice replacing a glass insulator on a pole at the Bonneville Power Administration's Technical Training Center. Though this line isn't "hot," a real transmission line like this one would carry 115,000 volts. 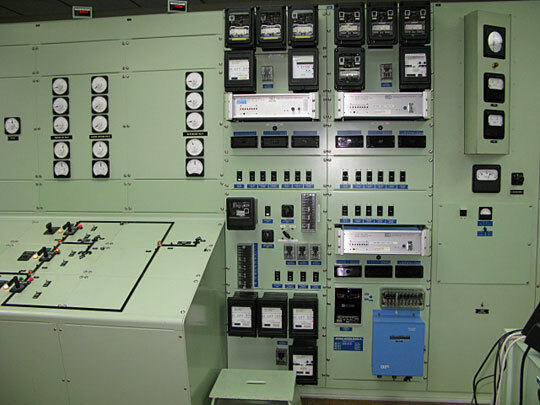 A console at the Bonneville Power Administration's Technical Training Center lets students practice managing major sectors of the electricity system in the area in a test environment. Though the technology is old, it still plays a key role in the grid. Many in the utility industry worry that the most vulnerable part of the power system is its work force, as a wave of retirements is depleting the supply of linemen and other craftsmen who keep the lights on. A historic jump in the number of power-related jobs is boosting demand for classes such as one called Power Production and Operation at Centralia College in Centralia, Wash.
"Many people who went to work in the electric power industry were there for 25, 30, 40 years," instructor Rulon Crawford says. "Now that they are leaving the industry, there's a ton of opportunity for this generation that's coming along." The International Brotherhood of Electrical Workers says nearly half its members nationwide are up for retirement in the next few years, and in response, Centralia College has formed the Center of Excellence for Energy Technology to train young workers like 19-year-old Haley Keithan — one of a handful of women in this class. She comes from an energy family — her dad worked for the local coal-fired plant. But, she says, "I want to go into more renewable resources, more so than coal or oil or anything like that." That's a common theme in the Pacific Northwest. Like many states, Oregon and Washington require local utilities to boost the portion of the power they produce from renewables. Travel up the Columbia River, which has long supplied this area with cheap electrical power, and you can see and hear what's luring students into the energy field. Wind turbines seem to be sprouting from every hilltop, and if you get close, you can hear them spinning lazily in a light wind. This is what's drawing students like A.J. Quackenbush to Columbia Gorge Community College, on the Oregon side of the river. Quackenbush is a muscular, curly-haired student in the renewable energy technology program. Students like him may be keen on renewables, but this program is meant to prepare them to work on the aging transmission grid as well. Quackenbush says he might end up expanding the system that connects those hilltop turbines to power-hungry cities: "I know there's been a lot of talking about installing a transmission superhighway, and I think having the chance to work on something like that would be pretty fulfilling as well." Local utilities here say that, at times, they are already producing more wind power than the electrical grid can handle. That means the viability of those wind turbines may depend on the eagerness of these students to help upgrade the electrical grid. But at a training facility in Vancouver, Wash., you can see just how resistant the old electrical grid is to change, and why it's so difficult to train new workers in this field. 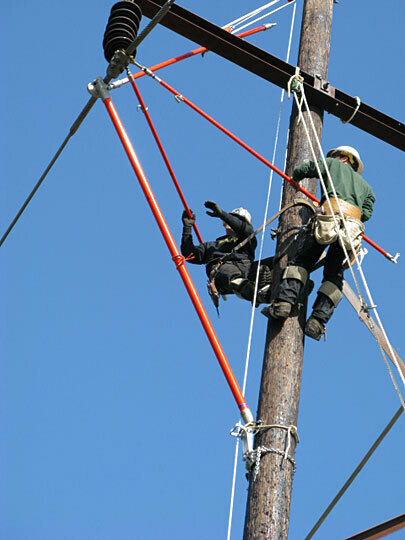 Two apprentice linemen have just made their first mistake as they try to replace a huge glass insulator 30 feet up on a telephone pole at the Bonneville Power Administration's Technical Training Center. On the ground, instructor Craig Froh razzes them, as he sees they have lost their focus and let the wire slip from their grasp. Froh is a burly utility guy, right down to the sticker on his hard hat that reads, "Drink til she's cute." "Now we're going to have fun," he shouts up to the apprentices, as they struggle to correct their mistake. 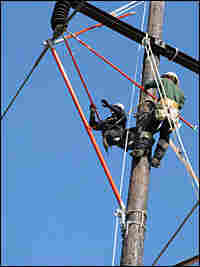 In real life, the wires these guys are working on would be live with 115,000 volts. Workers spend three to four years working as paid apprentices before they become journeymen, going through a ritual that dates back many decades. This is why people here refer to this business as a "craft" — while it doesn't require a college degree, it is both dangerous and arcane. In another part of the facility, 31-year-old apprentice Zack Banks is deciphering a roomful of dials and getting the juice flowing again during an imaginary blackout. Bells ding and meters flash in a central control room that's meant to replicate a real, working substation. With its old-style dials and clicking alarms, this place looks a lot more like a World War II-era submarine than a key node on the power system. Banks dials up the trainer in the exercise — using a rotary telephone. Bonneville hopes to get federal funding to help build a smart grid for the region. If that happens, workers here could someday be staring at computer screens and digital interfaces. 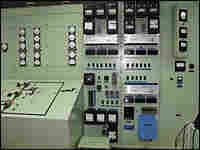 But for now, the next generation of electrical workers will have to get started on some very 20th century gear.